One of the great things about mirrorless cameras is that they are easily adapted to use vintage manual lenses. The short flange to sensor distance means that there is room for adapters to almost any vintage lens. High quality vintage Japanese lenses available for a small fraction of the cost of new optics. The auto focus, auto exposure, and motion compensation features that make new lenses so expensive have no value for astrophotography where all of these must be set manually. 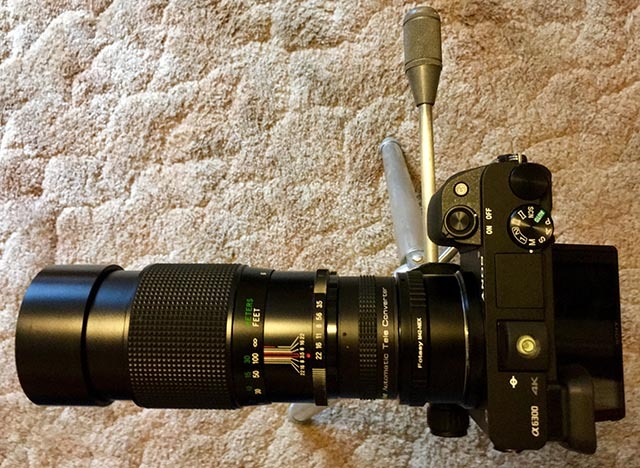 I decided on the M42 lens mount standard because of its availability and compatibility with Questar camera adapters. I started out with a vintage Minolta 135mm f2.8 lens which has given me some great images. Today I received a Minolta - Komine 200mm f3.5 prime telephoto lense and 2X tele-converter in mint condition for only $50. With my Sony a6300 these will give me 300mm and 600mm equivalent focal lengths. Test shots look great and I can't wait for clear skies for some real images. Weight is reasonable with: the ball head with dovetail clamp 12 oz., camera with dovetail 1 lb., tele-converter 4 oz, 200mm lens and E-mount adapter 1 lb 10 oz. The total of 3 lbs. 10 oz. is comfortably less than my Vixen Polarie's rated capacity of 4 lbs. 6 oz. With the 135 mm lens this gives me full frame equivalent focal lengths of 200, 300, 400, and 600 mm on my APS-C Sony a6300.